Above: Matt Stucky rides his bike up 30th Street in North Park past a sign that reads "Share the road," March 27, 2019. A group of cyclists is pushing for the city to redesign a portion of 30th Street in North Park with protected bike lanes. The father behind the campaign says it's a test of the city's commitment to climate action. 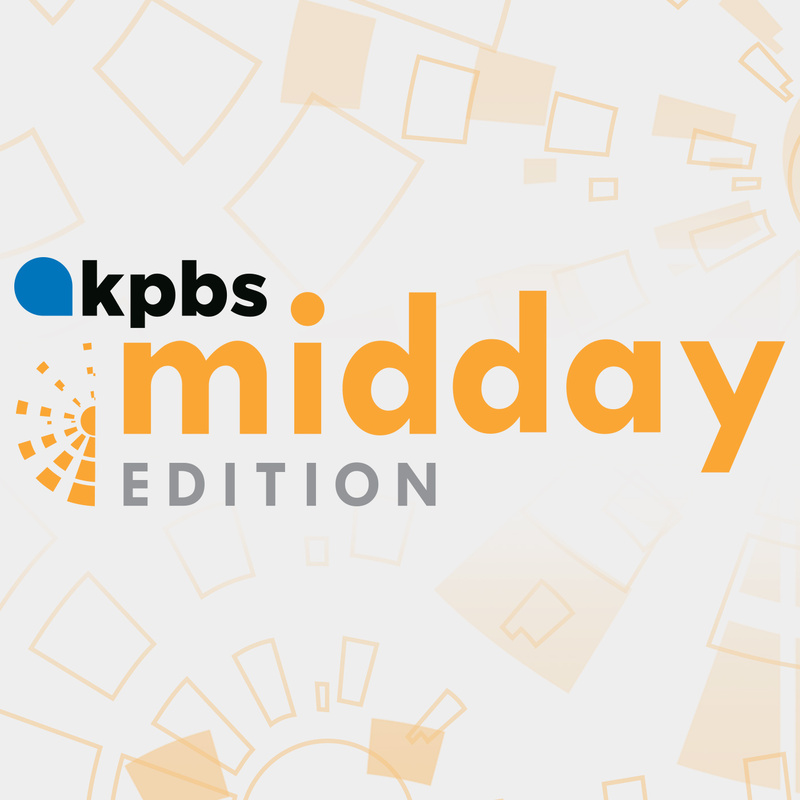 GUEST: Andrew Bowen, metro reporter, KPBS news. Matt Stucky helps his four-year-old daughter, Kate, fasten her helmet as he prepares to go on a bike ride around the block. Kate sticks to the sidewalks, but the section of North Park where he lives is quiet enough for his seven-year-old son and daughter, Luke and Blake, to ride in the street. When Stucky bikes to 30th Street, the main commercial corridor that runs through North Park and South Park, his kids stay back at home. "I think there's some people, maybe middle-aged men, who are comfortable riding there between the buses and speeding cars," Stucky said. "But if we want to expand the number of people who are riding bikes, especially kids or older people, they need protection to be safe on 30th Street." Stucky is the founder of a campaign to redesign a large section of 30th Street — home to a plethora of neighborhood shops, restaurants and bars — once the city completes the replacement of an aging water main under the street. After that work is done and the street is resurfaced, Stucky wants the city to add protected bike lanes. Protected bike lanes, also called cycle tracks, have some kind of physical barrier separating cyclists from moving cars. They are virtually nonexistent in San Diego's urban core. Plans for protected lanes along Fourth and Fifth avenues in Hillcrest and Bankers Hill have languished in the bureaucracies of the city and SANDAG for years. And while the city opened a two-way cycle track on J Street late last year, a planned nine-mile cycle track network downtown is still years from completion. Stucky said protected bike lanes are the best way for the city to meet the mobility goals in its Climate Action Plan, which expects the share of urban bike commuters to triple by 2020. "There's a lot of people who are willing to make that change and want to make that change and be more active, but they are only going to do it if it's safe," he said. City staffers have drafted two design options for the bulk of 30th Street. One would remove the center-turn lane and add painted bike lanes between the travel lane and on-street parking. The second would remove on-street parking and replace it with a protected bike lane wide enough to accommodate passing — a feature that works best for slower cyclists or those with less riding experience. A third design option has not yet been presented publicly. City Councilman Chris Ward said he is gathering feedback on which design to support through a series of community meetings and talks with city staffers. He said he will ultimately make a recommendation to the mayor's office, which has the final say. "I have a 5-year-old, and I have an infant, so I would want to have as safe a facility as possible that made me feel comfortable as a parent going with my kids," he said. Matt Stucky prepares to ride his bike with his son and daughter, March 27, 2019. The potential removal of on-street parking has been a roadblock to multiple bike projects in San Diego. At a March 14 meeting of North Park Main Street, the neighborhood business district, board members voted to support the painted bike lane option that would retain most on-street parking. The group's executive director, Angela Landsberg, said board members were wary of drastic change to the street design. "The evidence from their eyes is that there's just not enough people riding bikes to warrant the elimination of all of those parking spots," she said. But Landsberg quickly added more people would likely bike on 30th Street if there were a safe place to ride. And she said North Park does not have a problem with the supply of parking so much as the willingness of drivers to park further from their destination or to pay for parking. Financial reports for the publicly-funded parking garage at 30th Street and North Park Way show it was on average roughly two-thirds empty in the last quarter of 2018. Landsberg said if the city opts to replace on-street parking with protected bike lanes on 30th Street, the neighborhood would survive. "Studies have shown that if you build protected safe bike lanes, people will use them, and also that that does benefit business in those areas," she said. "So there's data to support that." Some North Park residents have shown up at public meetings voicing skepticism or reservations about the bike lane proposals, but they have not organized to the same degree as Stucky and other advocates. Stucky created an online petition that currently has more than 300 signatures, and he is co-organizing a group bike ride down 30th Street on April 13 to rally more support. On April 16, the North Park Planning Committee will discuss the various design options. The committee is scheduled to vote on which they prefer on May 21. Stucky, who was elected to a seat on the committee last month, said his quest to redesign 30th Street comes from more than just a desire for safe family bike rides in his neighborhood. He said he sees the project as a test of the city's commitment to taking meaningful action to fight climate change. "We were inspired by what the city did when it passed its Climate Action Plan and committed to reconsidering how we live," he said. "And I think as a parent, I need to be doing everything I can to make sure city lives up to those commitments."